Home › Latest News › H-D® Durban’s first ever Ladies-Only Garage Party! 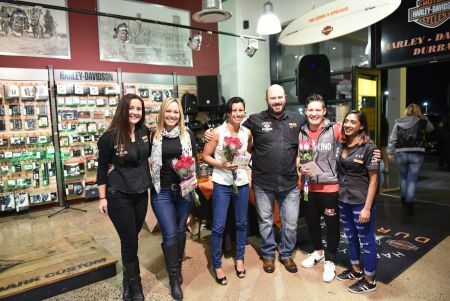 H-D® Durban’s first ever Ladies-Only Garage Party! Garage Parties are traditionally ladies-only events, with the objective of empowering the women in our community and leaving them feeling equipped to tackle life, make tough decisions and also provides a great networking opportunity and a safe place to make new friends. The team at Harley-Davidson® Durban decided that it was high time we hosted one of these parties! The date was set: 5 August ’17 at 6pm. A save the date was sent out a month and a half before the party to encourage ladies to mark the date off in their diaries. Being our first ladies-only Garage Party, we were unsure of how it would be received but were totally blown away by the support from fabulous sponsors and the interest from the women in and around Durban. We were even more blown away by the fact that ladies started arriving an hour early! The first 50 ladies to register received gift bags and our friends at Jack Daniels made sure that every lady was given a welcome cocktail. There were also snacks to be had! A wife, mom, business owner, speaker & blogger, she understands the pressures of balancing a successful business and enjoyable quality of life. Her mission in life is to help purpose driven, goal orientated and ambitious women to live fulfilled, well rounded, financially healthy lives to reach their God-given purpose & destiny. Having a career as a Surgical Rep, being a Mom, a Partner, a ShredBettys Team Rider and an adrenaline junkie when it comes to all Extreme Sports, Lanza has a real appetite for living life to the fullest. In December 2016 she was diagnosed with Colon Cancer. Fast forward six months later and she is busy with her last chemo session, kicking this disease to the curb. Amanda Lino currently ranked first in South Africa as the First Flyweight Women’s Champion and second in Nevada USA. With such a diverse range of guest speakers, inspiration could be found everywhere. Thank you once again to these 3 incredible ladies and to Amanda for her self-defence demonstration that equipped attendees with the basics in case of attack. Up next, H-D®® Durban’s very own female motorcycle sales consultant, Anria, demonstrated how to lift your bike if you drop it. This information is invaluable as anybody could find themselves in a situation where they need to lift a motorcycle. After Anria completed the demonstration, we opened up the floor to any ladies that would like to take turns in lifting the bike. The women who took us up on the offer completely surprised themselves by lifting a motorcycle that weighs over 200kg! To add to the thrill of the evening, especially for those who have never ridden a Harley® motorcycle before, we had a Dyno Machine present. The Dyno machine allows a motorcycle to be mounted and ridden on it without the motorcycle moving anywhere. The wheels of the bike spin on belts so it requires no riding experience for someone to give it a try! The ladies had an absolute blast on the Dyno Machine. 3. Jack Daniels donated caps as spot prizes and headphones, Jack Daniels Miniatures and keyrings for the goodies bags. A thank-you also goes out to the Harley-Davidson® Durban team, who pulled together to secure our guest speakers, sponsors for the event and who also worked late at the party! Last but definitely not least, thank you to our wonderful photographer for the evening, Petrus du Toit Prinsloo! Situated in Gateway Theatre of Shopping in the heart of Durban, The Hussar Grill Gateway delivers the same authentic grill room experience that has made the brand a resounding success in the Western Cape. Having garnered a loyal following over the past 53 years, The Hussar Grill is regarded as one of South Africa’s premier grill rooms and is known for their specialty steaks, award-winning wine selection and excellent service. Its traditional style setting and inviting ambience will make you feel as though you’ve stepped into a Charles Dickens novel – complete with vintage books, mahogany wood-paneling, leather upholstery and of course an intimate bar where one can retire to for a cognac. From carefully aged steaks grilled to perfection, to their very slowly roasted lamb shanks, The Hussar Grill is renowned for absolute excellence in selecting only the finest quality, 28-day aged, South African beef and game. The owners and management are passionately involved in the maturation, trimming and preparation of all grills each day. The Hussar Grill offers an award-winning Diners Club Platinum rated wine list that is carefully selected to accompany and complement their meals. To augment an extraordinary dining experience, guests are welcome to bring their own wines at no corkage. For an unforgettable experience, superb service and the best specialty steaks that Durban has to offer, visit The Hussar Grill Gateway.